Reporters in the United States often fail to include the ways educational policies have resulted in the subjugation and neglect of racial minorities in this country. There are numerous stories about how “black schools are broken” or how various cultures don’t value education. These perspectives are often based on insufficient, superficial reporting. It’s crucial to recognize race in the context of the modern education environment in order to explain why racial minorities are so unhappy about the ways they are treated in today’s public schools. The analysis in this section shows that the U.S. is capable of providing students with an education that few countries in the world can match, but it also emphasizes that such education is available almost exclusively to white students. For this reason, the evolved narrative that American educational strategies are inherently flawed — many assume this to be the case — isn’t necessarily true. Instead, we should identify and demonstrate how racial barriers and other instances of structural racism have prevented many Americans of color from achieving personal success. Any understanding of modern socioeconomic systems must emphasize the importance education has in improving a community’s quality of life. This fact is consistently demonstrated through any formula or measure that tries to quantify a nation’s educational success. The United States, although not on par with the most advanced European and Asian nations, regularly ranks among the top nations in the world in terms of economic capacity. In some indices, such as the Education Index, the U.S. is ranked as high as fifth in the world. There are few places in the world where education is more available than it is in America. In score-specific rankings, though, the U.S. ranks 10-20 places lower. Look, for example, at the effective Programme for International Student Assessment rankings from 2012. In these rankings, compiled through a two-hour exam sponsored by the Organisation for Economic Cooperation and Development, the U.S. ranked No. 24 in reading, no. 28 in science and No. 36 in mathematics. Although these placements are better than the OECD averages, they certainly leave room for improvement. What does this all mean? While the average American student is receiving more education than he or she would get in most places throughout the world, that education may be of lower quality. In some ways, we already know this. After all, it’s no real secret that Americans attend primary schools longer than students in most OECD nations. The United States’ Asian students are on par with the top-scoring countries in educational achievement. No nation ranks higher than that group’s 550 reading score. White Americans also score remarkably well. That group’s mean score of 518 is greater than those in Australia, Germany, Ireland, Belgium, New Zealand, France, Austria, Belgium and Norway. White Americans don’t score as well as Asian Americans, but any group that outscores that list of countries is doing remarkably well from an educational standpoint. Hispanic Americans trail students in Russia, Lithuania and Greece. For African Americans, it’s even worse. That group’s mean score is lower than scores in Turkey, Bulgaria, Romania, Serbia and Thailand. 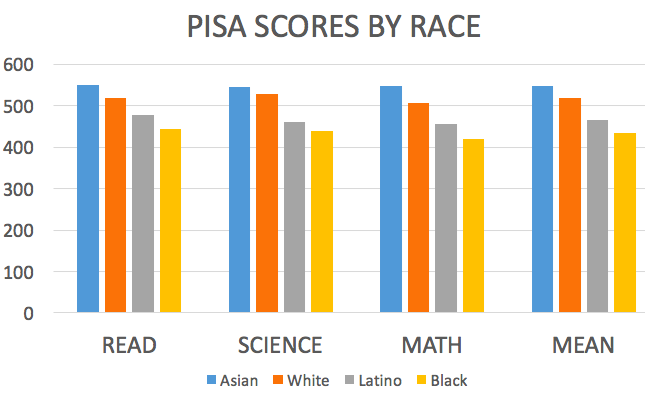 The differences between these groups and white or Asian Americans are staggering, but they point to something important: The U.S. has the ability to score near the top in education, but it is failing at doing so. There are demographic, institutional and historical barriers in place that prevent students with these backgrounds from having the same opportunities for success. The American news media must rethink how those communities are covered. Given that a younger generation consumes a great deal of media, there is a much-needed chance to start over. Differences in educational attainment are not coincidental, and barriers exist that prevent students with certain demographic backgrounds from having equal opportunities for success. Although American history has provided extensive examples of this, others are unreported. Journalists must uncover these barriers and increase public awareness. The barriers that faced African Americans in the U.S.’s early years were obvious. Many were slaves and slave owners prevented many from going to school. After the Civil War, changes were anticipated, but many did not occur. This became foundation for Jim Crow laws in the South where schools for African-American children were underfunded under state guidelines and legal loopholes. White students in Tuscaloosa attend one of the city’s two other high schools with the city’s wealthier African-American and Latino students. Central has also become a “dumping ground” for inferior teachers from the area because the best teachers wouldn’t not apply to teacher. Wherever they live, journalists can find the disparities and methods of discrimination that exist in their communities. Language is important. If you have to ask yourself whether you think a word or phrase is appropriate, it probably isn’t. Know what you should say and how you should say it. Don’t be afraid to admit you don’t know something. If you don’t know what being a racial minority in school is like, admitting so can often be the right approach to take. Don’t lump problems together. African-American students in Kansas City aren’t the same as African-American students in Washington. Latino students in Texas are aren’t the same as Latino students in San Diego. Some broader concepts will still apply, but you should know the specific problems facing the community you cover.